After two films about the not-so-despicable-after-all Gru (Steve Carrell) and his minions that made the world fall in love with the little yellow gang and paved the way for enough minions' merchandise to fill a mall, and a spin-off film that gave rise to around the same number of disappointed fans, Gru is back on the big screen in Universal Pictures' and Illumination Entertainment's fourth bid to capitalize on the success of the minions' debut movie. Gru has gone from being an evil and carefree bachelor to a semi-responsible single dad of three, and has finally settled down in this instalment with Lucy Wilde (Kristen Wiig). The newly-weds are enjoying life as AVL (Anti-Villain League) agents in the company of their daughters - Margo (Miranda Cosgrove) is dealing with the headaches that so often accompany teenage romantic entanglements, Edith (Dana Gaier) is still her mischievous self, and Agnes (Nev Scharrel) is determined to secure the affection of a unicorn. But there is trouble in paradise when their marital bliss is disturbed by Balthazar Bratt (Trey Parker), a former child star throwing destructive tantrums after his fall from fame. The plot of the movie is the usual fare of animated movies, and nothing revolutionary - Bratt, with his arsenal of heist music and self-inflating bubble gum, has had a bit of an identity crisis and sees himself as the television character he once played. Intent on exacting revenge on the people of Hollywood who discontinued his show, he sets into motion a nefarious plan of villainy and mayhem. In a sort of children's version of the beginning of Mission Impossible: Rogue Nation, it falls to Gru's and Lucy's lot to work around the authorities and stop Bratt the brat's wicked ways. What makes the movie a sweet, wholesome watch for adults and children alike is the same thing that the Despicable Me series has done best from the beginning - the gradual, believable development of various familial bonds. The progression of Lucy being accepted by the three girls as their mother is beautifully shown, with the touching moments balanced by humour and silliness. The long-lost twin brother may be a cliché, but the sibling relationship between grumpy Gru and legally blonde Dru is wonderfully illustrated. Gru's joy and apprehension of meeting his brother and the playful sibling rivalry between the two is true to life. The way their dynamic is expounded upon sends an important message to the younger viewers, too - that despite hurtful words, anger and fights, you always have your family's back when they need you. The movie is not as gripping for adults as the first part was, but it appeals to the target audience and is an amusing watch overall. 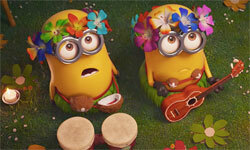 The minions make up for the dull moments with their adorable antics and comical jibber-jabber (Pierre Coffin deserves half the credit for the minions' cuteness for his voice alone). If you weren't a fan of the minions before their song, you will be after you see it. In a pretty enjoyable soundtrack, this song with the gibberish lyrics takes the cake. Steve Carrell does an excellent job voicing the opposing characters of Gru and Dru - gruff and annoyed (but really a big softie) for Gru, all excitement and eagerness for Dru, and funny for both. Kristen Wiig's voice suits Lucy as mostly silly, flustered and soft, but terrifying enough when her protective, momma-bear instincts are brought to the forefront. Trey Parker is a sound fit as the whiny, spoilt (and fabulous, too - the man has got some awesome dance moves) Balthazar Bratt, and makes a good antagonist for a children's comedy flick. Cosgrove and Gaier play their parts as the elder girls well, but Nev Scharrel is particularly endearing as little, loving Agnes. The quality of the animation is first-rate, with the characters and their expressions real and accurate enough to make you forget that they are CGI and not actual people, despite their quirky body structures and disproportionate heads. The 3D effects are exceedingly well done, and add a whole other dimension (pun intended) to the theatre experience. Despicable Me 3 does not have a lot of subtext for you to dwell on, nor does it encourage your children to read between the lines and pick up on a deeper message. But if you feel like getting away from the complications of life with your child (or even alone) to enjoy a slightly ridiculous movie with a silly charm, slapstick humour and minions, this is the film for you. So go get a "gelato" and go "bananas"! 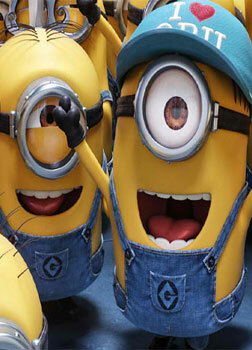 Be the first to comment on Despicable Me 3 (3D)! Just use the simple form below. fullhyd.com has 700,000+ monthly visits. Tell Hyderabad what you feel about Despicable Me 3 (3D)!